Apple cider vinegar. It's where I'm going to invest all my futures. Acquistions; get cider press. Mergers; press the hell out of all the weird wild apples that grow around Worlds End. Press the bugs and worms right along in there, all the residual dust and microorganisms that cling to ripening apples on the branch all summer and all the bacteria and fungus that take up residence on the skins once the apples drop in the fall. I go around picking up apples in October, small - the size of golf balls, biting into some (bleh!) or tossing some to the dogs for fetching. Almost lost a finger once to an enthusiastic sheep as I fed her an apple, it was an affectionate interspecies moment gone wrong. People don't think of sheep as having sharp teeth - but most lambs are born with a set of tiny razor chompers, which sometimes need filing down so that new mother ewe's don't get their teats in a bloody way. They leave all that out in the bible. The mentions of shepherds and sheep generally focuses on the power dynamic between leading and following blindly. Incidentally, goats are often associated with the devil because they have minds of their own and don't flock. Eric always wanted goats (friends to be mischeivious with?) and I always wanted sheep (subjects that follow and don't talk back). 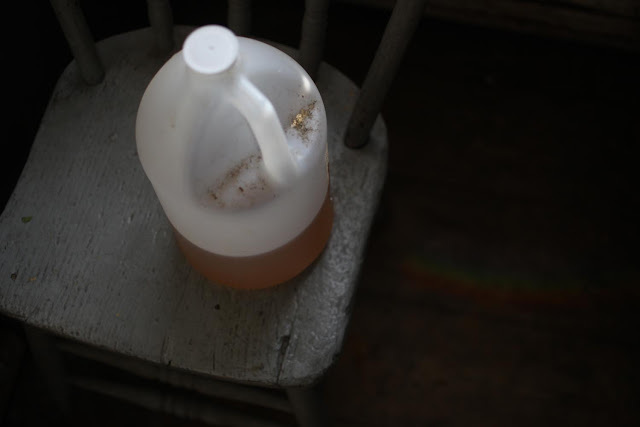 Apple cider vinegar is good for sheep, as it is for humans. Shepherds use it to fight parasites and also to combat white muscle disease and improve general vigor and fleece quality. Zoe washes her hair with it. I drink it constantly diluted in quart jars of water that get left all over the farmyard and house. In the economy of Worlds End, ACV (for short) is one of the most precious commodities, which is why we need to make our own in 2019 - a year fortuitously predicted to be a boon apple year here in the Mohawk Valley where many wild trees exhibit a pattern of biennial bearing. But I'm here today to talk about pickling vegetables. 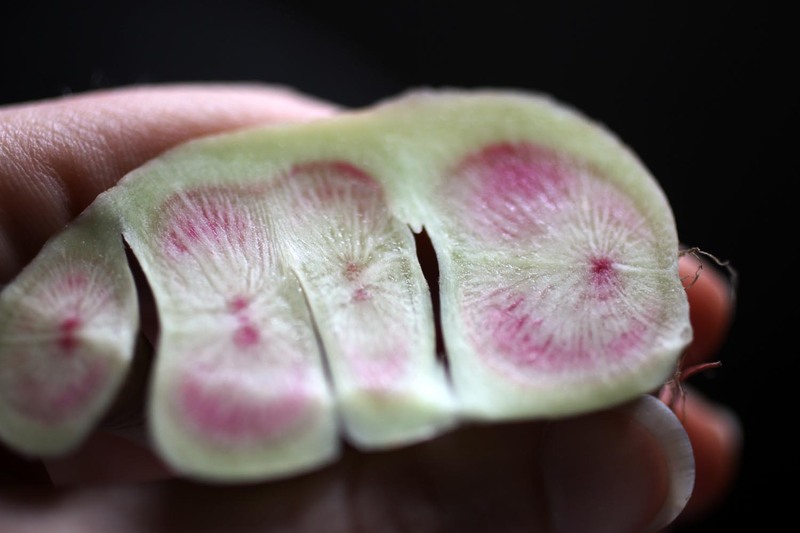 Specifically watermelon radishes. And perhaps also, my penchant for trashy snack foods. Recently on a road trip I bought a bag of combos - delicious! I thought about what is required to make a Combo - the pretzel tube, the pepperoni pizza cheese filling (my personal preference), the factories, the combo workers, the conveyor belts....the raw commodities of wheat, corn, monosodium glutinate. The shipping departments and the distribution centers. The Pizza flavoring which implies a flavor lab...a white room somewhere in the outer orbits of the packaged snack foods solar system. Inside the Combos headquarters, a flavor meeting adjourns and someone casts out the new flavor signal. It travels in binary code through the putty-colored, polyester padded partitions and lonely interstitial spaces of snackfood informational architecture. Pausing finally at the precipice of the flavor lab's email inbox, its message instantaneously reconfigured and now pulsating the pertinent news from the flavor future: Honey Sriracha. 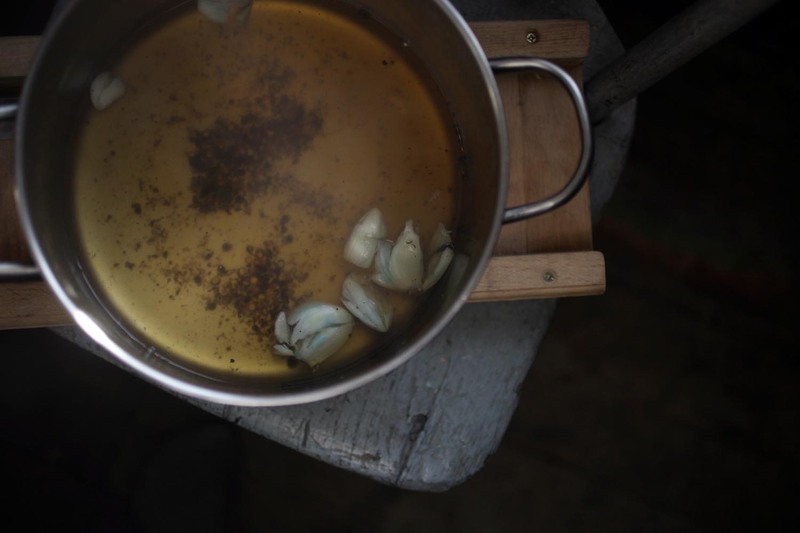 Of course the most robust flavors can often be made with the simplest ingredients brought to us straight from the garden or woods; the original flavor labs. In reality the difference between natural and artificial flavorings is determined by the FDA and the lobbyists of major food corporations who spend the most money. The 'natural flavors' that make your LaCroix taste like grapefruit are in fact widely found in nature and also in popular cockroach insecticides. I've come to feel the use of the word 'natural' in the world of products is empty of any real meaning and insults our innate intelligence around feeding ourselves in order to feel good. But if everyone did that - just ate as they felt - whole sectors of the wellness and diet industry would collapse and the profits that result from people looking to professionals for guidance would dry up. The infrastructure that manufactures garbage food closely resembles the health industry that supposedly recovers us from it. That's capitalism's effect on our bodies. I'm not interested in snackshaming here. I like eating junk food. I also like feeling my own body and noticing what it's craving. Knowing ourselves and feeding ourselves is so deeply intimate. 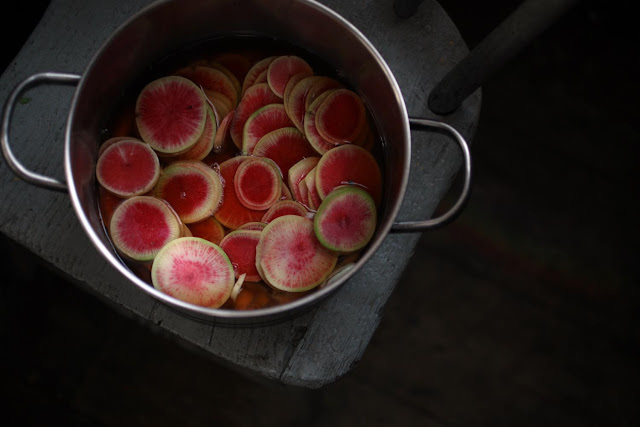 Lately, what makes me feel good is pickling every vegetable I can get my hands on in a salty apple cider vinegar brine. I eat these radishes on my evening cheese plate, on faro with fried eggs and harissa, with lamb liver toasts, by themselves while I'm cooking dinner. I also use this brine for carrots, sliced on the diagonal. You can chop a habanero pepper in the brine to heat it up. 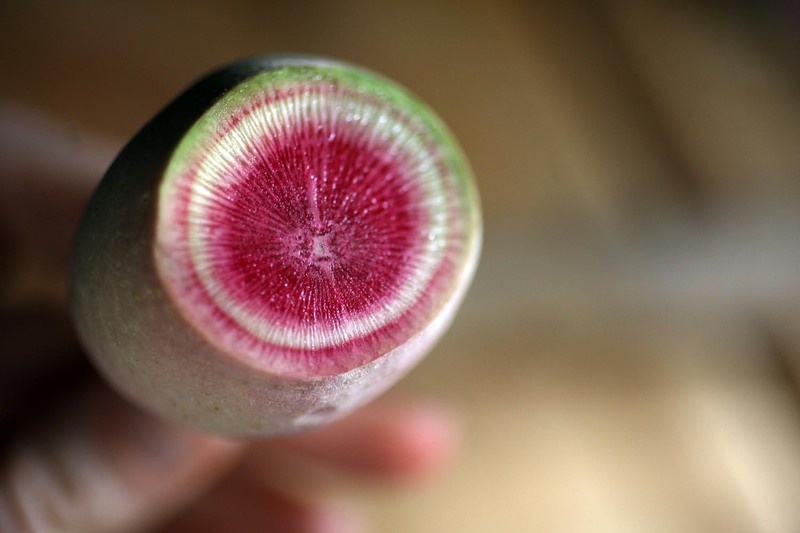 For about 5 lacrosse ball-sized watermelon radishes sliced thin or about 6 carrots sliced or julienned or about 1 head of cauliflower cut into florets...black kale, turnips, etc. Mix these ingredients, boil them and toss your vegetables in and remove from heat. 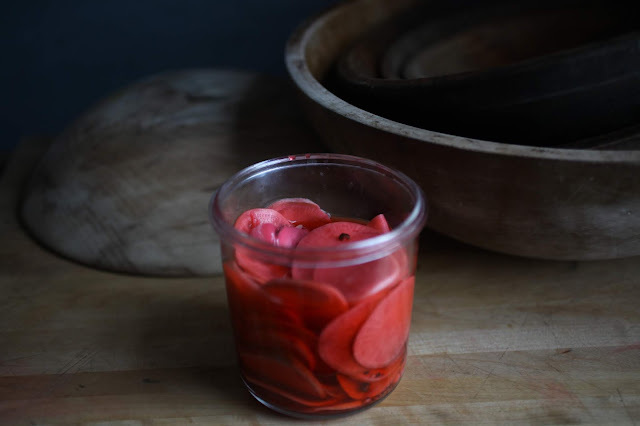 A very thinly sliced radish needs less time in hot brine than say a piece of cauliflower (you don't want to actually cook your vegetables, just log them with that salt and acid) so sometimes I toss in the brine, then take out and cool separately, adding some of the liquid brine back in before storing. Store in the refrigerator for up to two weeks, take out and serve with everything as you would your favorite condiment.